I love this time of year. Halloween has been my favorite holiday for as long as I can remember and when I became pagan I incorporated the practices that I loved about Halloween with the ones I learned went along with Samhain; luckily for me trick'or'treating and dressing up in costume are pretty strongly connected to the old Celtic custom of guising which have continued until today. In Ireland up until around a hundred years ago there was still a practice of a small parade led by someone dressed as a white mare that would go from house to house singing and asking for "tolls" (Estyn Evans, 1957; Danaher, 1972) . In some parts of modern Ireland children still chant “Help the Halloween party! Any apples or nuts?” when trick or treating (Danaher, 1972) All through Scotland it was the custom of groups of boys in costume to go door to door asking for money or treats, often while singing or chanting which slowly became the custom of younger children that we consider trick or treating in modern times (McNeill, 1961) . I took my children out trick or treating, with the girls dressed up as Cleopatra and a pirate queen respectively. It was extremely fun being out at night with the children, under the crescent moon, with the snap of snow in the air. We had actually had an unusual early snow storm last Saturday that knocked out power and generally mucked things up for awhile, but by yesterday everything was enchanted. Now the modern dating of Samhain is given as October 31st and this is when I choose to celebrate it for convenience, but in reality the date was originally not a set calender or astrological date, as far as we know, but rather was an agrarian date In Ireland and Scotland; although the Coligny calendar of Gaul does list three specific days as "Trinuoxtion Samonii" or the three nights of summers end (Kondratiev, 1999). In practice Samhain celebrations occurred in November because this was the end of the harvest and the time when the herds were brought back in from the fields, but it wasn't until the Catholic church moved their celebration of All Saints and All Souls day to the first days of Novemeber that Samhain seem to have gotten a set calendar date in a modern context (Estyn Evans, 1957; McNeill, 1961). Of course then the switch was made from the Julian to Gregorian calendar and so you still see people celebrating Samhain on November 12th, refusing to acknowledge the change (McNeill, 1961). I debated for awhile trying to hold to a more traditional agrarian marking of the date, perhaps at the first hard frost each year, but with the kids it was just too difficult to get them engaged and excited about it when it seemed random to them. I do however follow what Caesar said about the Celts starting the new day at sunset and the new year at Samhain and begin my celebrations at sunset of the 31st and I also generally make it a three day celebration, something that is supported by the Coligny calendar and at least tenuously by the Irish belief that it was actually on November 2nd that the spirits of the dead returned to visit the living (Freeman, 2002; Danaher, 1972). After trick or treating we came home and had a small ceremony together. We lit a candle for those we love who have passed and talked about them, things we remembered and missed. It was an old practice in Ireland to light a candle for each deceased member of the family and to leave the doors unlocked - in some cases even open - and to leave out either fresh water or porridge as an offering to those ancestors who chose to visit (Estyn Evans, 1957; Danaher, 1972). Our lighting the candle carved with their names is our way of carrying on this tradition. Then, in honor of the idea of leaving out food for the dead, we took a cake that we had baked earlier in the day and put pieces outside for the Gods, daoine sidhe, and ancestors, all in different places, as well as leaving out something for any wandering spirits. And we went back inside and each had a little piece of cake ourselves. Then the children went to bed and I did some divination on my own. 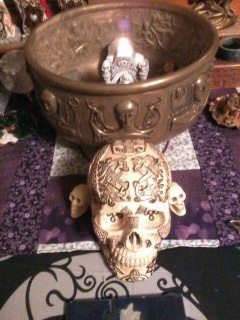 Tonight is the second night of my Samhain celebration. I will honor an Morrigan and an Dagda who united on Samhain, and who are both deities I am personally close to. I will kindle a sacred fire symbolically relighting the fire of my hearth and of the world* and I will do some more divination and make charms to bless my home in the coming year; Samhain was associated with a solar cross charm similar to the Brighid's cross of Imbolc and with using fire to sain the property (Danaher, 1972; McNeill 1962). Tomorrow will be focused especially on honoring the dead and on blessing the people of the house for the year to come using the ashes of tonight's fire. And then Samhain will be over for another year. Kondratiev, A., (1998) . The Apple Branch: a path to Celtic Ritual. Citadel Press. * If anyone is curious about why I place the ceremony with the ritual fire on the second day and not on the first where it should more logically be - the first night is very much about doing as much as I can with my children and my youngest daughter, at this point, has several issues that make anything involving total darkness a bad idea. I am still working out what exactly should go where, ritually speaking, and next year I hope to have the fire on the first night in a more "traditional" way since fire was such a major part of this holiday. But this year, this is how things worked out. Sometimes you just have to roll with it.